We have round diameter cesspit filters - available now! PC Environmental Ltd is committed to keeping our environment clean, fresh and clear of debris and pollutants. 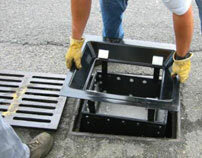 The installation of one of our catchpit filter units stops pollutants entering our precious waterways 'at source'. Should your council require the installation and maintenance of storm water filters, contact the specialists - a PC Environmental consultant for an on site measure and quote.